If you’re looking for a backcountry getaway, don’t let winter temps stop you from your tree-lined dreams. The five huts below are smack-dab in the middle of the mountains—remote enough to help you recharge your mind and reignite your sense of adventure. 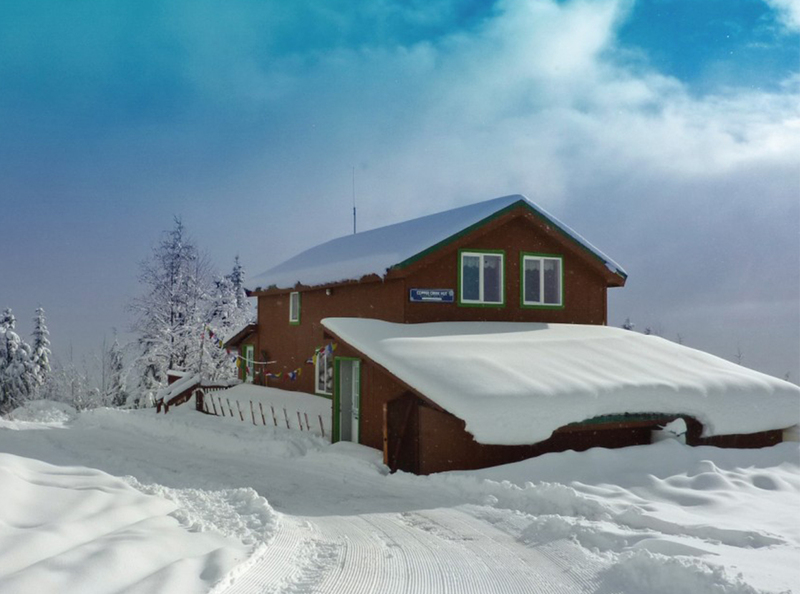 Each locale requires you to snowshoe, ski, or hike to your lodging where you can hole up for a few days, and have access to winter sports right at your doorstep. With zero WiFi and solar-powered electricity (plus some back-up generators), you get the ultimate respite that’s free of modern-day distractions. It’s just you, your best buds, and probably a few strangers hanging out, drinking whiskey, and contemplating why it took you so damn long to schedule your stay. Book an early 2019 trip ASAP (lodging is cheap and typically bunk-bed style); bring some food (and some booze); and have a wooded escape that fulfills your need for R&R and exploration. Just keep in mind: You should be comfortable in the backcountry (and on skis, if that’s your preferred mode of transportation) when traveling to these serene spots. You have your choice of four different huts—Flagstaff, Grand Falls, Poplar, and Stratton Brook—when you reserve your stay up north, though Flagstaff is the most popular. They’re all part of Maine Huts & Trails. Majority of guests reach each lodge by cross-country skiing, but snowshoeing and fat biking are also viable options. From mid-December to late March (as well as mid-June to mid-October for the summer season), a full staff cooks meals and sells beer and wine, so you don’t have to worry about packing everything. Between lounging, reading, and playing board games, you can also take the available snowshoes out for a walk in the wilderness. Can’t make it in the winter? You can hike, mountain bike, or even kayak and canoe to these huts—which have plenty of trails to continue your activity of choice while you stay. Equipment rental: Reserve cross-country skis at nearby Sugarloaf Outdoor Center. And check out Allspeed or Carrabassett Valley Bike for gear rentals during the summer and fall seasons. 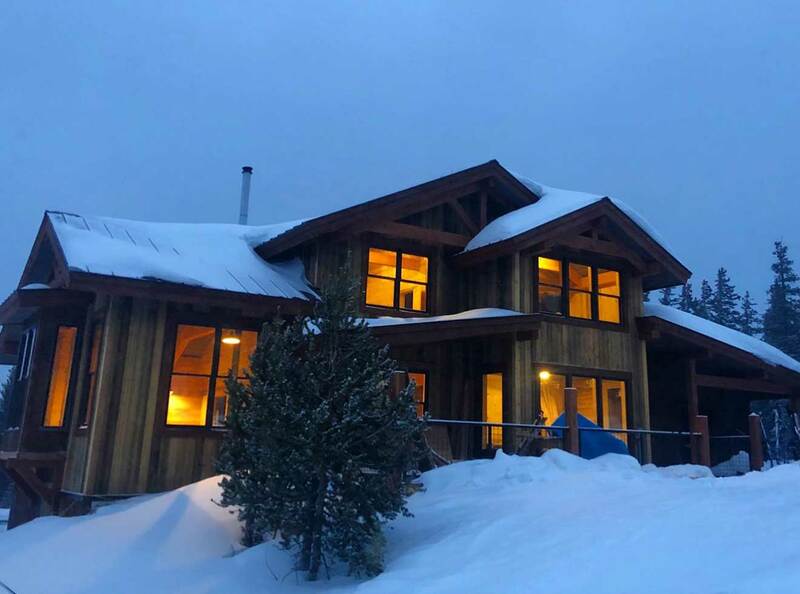 Opening this month, Sister’s Cabin offers ample opportunity for backcountry skiing, snowshoeing, or split-boarding. To get there, you’ll start at the Sally Barber trailhead in Breckenridge and trek 3.5 miles while gaining 1,500 feet of elevation. At the top, you’ll settle in at 11,445 feet—no joke for someone who’s used to living at sea level, but it’s totally worth it for the views of Breckenridge Ski Resort. In addition to getting cozy on the couch, Sister’s Cabin has a wood-fired sauna for extra relaxation, so don’t forget your swimsuit. You’ll want to hit the trails for more backcountry skiing and snowshoeing while you’re there. Hang back inside after and mix up your favorite meal—just make sure you bring your own ingredients. Equipment rental: You can rent gear from tons of shops in downtown Breckenridge, but try Mountain Outfitters for skis (and safety gear). Go to Ridden for anything else, including backpacks and winter clothes. Need more info? Set up a guided trip with Colorado Adventure Guides if this is your first time heading into the wilderness. We recommend checking out 10th Mountain Division for more FAQs on booking. If you’re looking to have a camping-like escape from real life, Carter Notch, Lonesome Lake, and Zealand Valley cabins are the ones to book. It’s all part of the Appalachian Mountain Club hut system. They offer beds and caretaker service at limited hours, but otherwise you’re on your own. That means you’ll make your own food and create your own list of must-do activities. We suggest hiking and backcountry skiing (if you have the experience)—then maybe a nap. To really give you that outdoor camping experience, there’s no heat in the bunkhouses, so make sure to bring lots of layers and a degree-appropriate sleeping bag. Also, to reach each hut, you’ll need to hike (or snowshoe) nearly two to four miles—or you can sport your skis and skin up to the top of the trail, then carry them for the final ascent. No matter how you get there, you’ll be glad you made the excursion. Equipment rental: Stop in North Conway to rent equipment—spots like EMS or Stan and Dan’s will provide what you need. Need more info? Opt for a guided lodge-to-hut experience, where you can still hike, snowshoe, or ski to your destination. It’s no easy journey to get to High Hut, Bruni’s Snow Bowl Hut, Copper Creek Hut, or The Yurt (which is the farthest)—all run by Mount Tahoma Trails Association. In fact, you’ll travel at least three miles, with more than 1,000 feet of elevation gain to get to any of them, so it’s not for the newbie winter hiker (or snowshoer or skier). But if there’s fresh powder and you feel like turning up the adventure, they’re kickass journeys. Once you reach your destination, you’ll see crazy views of Mount Rainier at High Hut, Bruni’s, and the Yurt. You’ll also catch Mount Adams and Mount St. Helen’s at High Hut and Bruni’s. So take it all in when you reach the top. While you can stay for free all day, hanging out in the common area, playing cards or drinking brews, you’ll have to book an overnight stay, starting at 7 p.m.
Equipment: Head to Whittaker Mountaineering for gear and maps of the area. Need more info? Mount Tahoma Trails Association suggests you pack these 10 backcountry essentials. Inside, you’ll find all the kitchen essentials you need to cook a good meal, as well as a wood stove, plenty of games and a shotski—the true sign of a good time. Outside, enjoy more skiing, split-boarding, or even ice climbing. Equipment: Reserve some winter gear from Tahoe Sports Hub or The Backcountry in Truckee. Need more info? If you want a guide for your journey, check out Alpine Skills International.